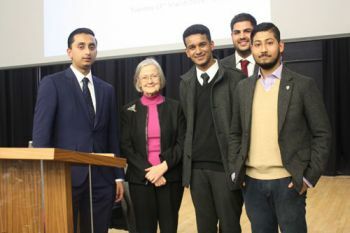 Hosted by the City University London Law Society, over 300 students turned out to listen to a talk delivered by Brenda Marjorie Hale, Baroness Hale of Richmond, Deputy President of the Supreme Court of the United Kingdom. Law students Airianna Mapp and Zain Ismail give their impressions. 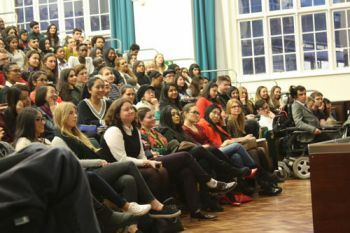 The most powerful statement to take away from Baroness Hale of Richmond, the Deputy President of the Supreme Court's speech to City law students on March 15th 2016, was that all women contemplating a career in law need to remain true to themselves. In a speech sub-titled, 'Life of a Lady Law Lord', she said that too many women come into the legal profession thinking that they must change the way they act, speak, or think in order to pattern themselves according to a patriarchal and ‘judicial’ way of thinking. The British legal community has always been perceived as a boys’ club; many women try to adopt a male mentality in order to be successful. In order to effect real change, however, women need to bring their own perspectives and experiences into the legal field with them. The discussion commenced with a brief glimpse into the past and current activities of Lady Hale, as she ascended to the judiciary and ultimately to the UK Supreme Court. Lady Hale has been a part of some of the most influential decisions in British law for the last few years, including the meaning of domestic violence taken from the case of Yemshaw v London Borough of Hounslow. Women have different experiences, backgrounds and lead varying lives. To be the only woman sitting on the Supreme Court encourages her male colleagues to look to her for a female way of thinking and she says this is incorrect. While her appointment to the Supreme Court is an important move towards diversity, Lady Hale did not believe the motivations came from a desire for gender equality. “I was in the right place at the right time,” Lady Hale commented on her appointment. She believes there are many women who could be successful in the higher echelons of the judiciary but they need to be given the opportunity. At a time when other common law jurisdictions were diversifying, Britain remained steadfast in its male-dominated judiciary. .
Lady Hale was adamant that there is need for more diversity in gender, ethnicity, race and sexual orientation on the Bench. The Lady Justice did not attempt to soften her words: the main problem stopping women from ascending to the Bench is their lack of confidence and mental negativity. It is no surprise that life at the bar is difficult. Income is generated from self-employment and there is a lot of stress that comes with that aspect of life at the Bar. Lady Hale noted that neither women taking leave for motherhood nor discrimination were the main problems for lack of gender diversity. It was mainly the lack of financial security causing this difficulty for women. She noted that women have a tendency to prefer being guaranteed of their financial situation when raising their families and therefore chose to move laterally rather than vertically with regards to their careers. Instead of remaining self-employed barristers, many women are choosing to align themselves with companies, taking in-house counsel roles, or even preferring positions as solicitors given the financial security. Women are just as capable of being successful in the judiciary but the belief that their appointments only fill quotas holds them back, in her view. Many women choose not to apply for fear of how their appointment will be perceived by the legal community at large. Changes to that perception are slow in coming but necessary so as to secure more diversity at the judiciary. Lady Hale observed that a frequent criticism of diversifying the Bench is that more women at the Bench will take away the merit of appointments and lead to a system based on reaching targets rather than endorsing quality. Lady Hale efficiently and succinctly eliminated that perception bu saying that encouraging more women to seek judicial appointments could only broaden the group of qualified candidates. Women who are applying know they are able to do the job; successful female appointees are only given the job based on their qualifications and the general understanding among their colleagues that they are capable of this position. Lady Hale is therefore encouraging more women to apply to judicial appointments and erase their own negative belief about not being appointed based on merit. There are a great number of qualified women but they must remain confident in their abilities and actually apply for judicial appointments. More diversity will not diminish the quality and merit of the candidates but actually enrich the system. Maintaining targets, however, will negatively impact the judiciary. Lady Hale also stated that the United Kingdom remains one of the strongest role models for legal systems around the world. With the Chief Justices of Canada and New Zealand, however, being female and many judiciaries becoming more diverse, it does make the world wonder when Britain will modernize with the times. 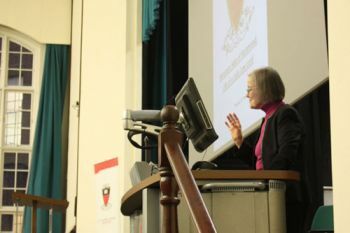 On 15th March, we had the pleasure of welcoming and hosting Baroness Hale of Richmond to speak on the ‘Life of a Lady Law Lord’. Initially, we got in touch with Ayo Onatade (Head of Judicial Support at The Supreme Court of the UK) to support us in organising this event and our invitation to Baroness Hale was kindly accepted shortly after. 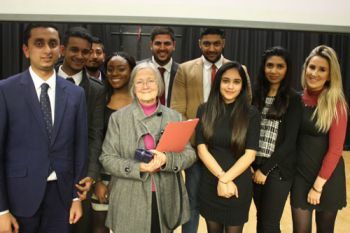 Alongside her career journey and how she became a ‘Law Lord’, Baroness Hale touched upon a broad range of issues within the law and more importantly, how students can progress to make a change to these issues. This also included a great Q&A session which allowed Baroness Hale to enter into more depth and elaborate on some of her points. As a student-led Society, we always strive to organise events around student interests’ and we hope attendees found this talk interesting and useful. We would like to thank The City Law School for their unwavering support in not only supporting us on this event, but also throughout the year and beyond. Airianna Mapp is a student on the Graduate LLB programme and holds a degree in Political Science from Western University, Canada. Zain Ismail is a Final Year student on the LLB programme. He was elected as President of the City University Law Society in July 2015, after being Treasurer from December 2014.